Posted October 24th, 2012 by David Porter & filed under Hot Topics, MailBigFile, Social. Following various successes of remotely controlled military flight devices against terrorist targets, the day of the drone is upon us. Home Office minister Damian Green has said that UK police forces should see drones as just like any other piece of police kit and as part of air support ‘if it is appropriate and proportionate’. His comments came as a new National Police Air Service came into being, designed to beef up police airborne activity. Drones can do far more than fully-manned police helicopters and for a fraction of the cost, and can remain in the air for longer. The Civil Aviation Authority does not permit drones out of sightlines to be used. In time, of course, objections will be swept away and another staple of the sci-fi industry will have come to fruition – permanent remote surveillance from above. The police forces of Suffolk and Norfolk, among others, have welcomed the setting up of the new body as a way of improving the helicopter response time across the two counties who have shared a machine since 2011. That’s not very controversial. It’s the drones that are highly contentious. Anything that weighs less than regulations in the rules that govern the skies, is not regulated, according to Emily Carr, deputy director of Big Brother Watch, a public spending watchdog group. She said it’s that weight issue that the manufacturers of drones are keen to exploit. There must be rules. Or we’ll all want drones of our own to spy on what’s going on somewhere else. Drones aside, technology continues to be exploited in the never-ending fight against crime. 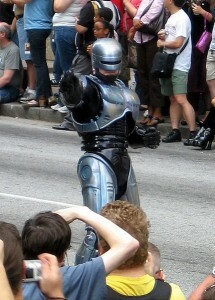 Reports on Yahoo (1st October 20-12) that a lab in Florida is working on ‘a real-life Robocop’ stirred a lot of interest. The project is a mobile robot which can spot crime taking place and is piloted by a disabled police officer. The lab is apparently working with two US military Urban Warrior robots from the Institute for Human and Machine Cognition which cost half a million dollars apiece. They are technically ‘telerobots’, a mix of ‘telepresence’ and robotics.They will allow police to enforce the law, interact with the community, patrol and respond to emergency calls. Officers can ‘see’ what is happening at street level or in big facilities that need guarding through cameras, in the same way they can now with CCTV, but these are on mobile beings who can see further and move to get a better look. They can also boom out warnings and ‘issue citations’. And shoot people? Well, that may come. The driving motive behind the scheme is to allow disabled police officers to ‘still serve on the front line’. Further, disabled combat veterans could also learn to pilot them and so secure work after their military discharge. It’s seen as a natural progression of telerobotics in medicine, business and defence. That’s great and if it helps strengthen law enforcement generally and giving meaningful jobs to people who struggle in many areas of employment, fantastic. But one thing we surely learned from the 2012 Paralympics is that people are all differently abled, not disabled? Differently-abled is very politically correct, but for once it’s accurate. If people without legs or arms can do what they did to such a standard, then they are not disabled. Technology helps us all, and why not?